Scottish nets leap by a massive 50% in 2013. The number of salmon killed in nets in 2013 was 50% higher than in 2012 – according to the official Scottish Government figures released today. 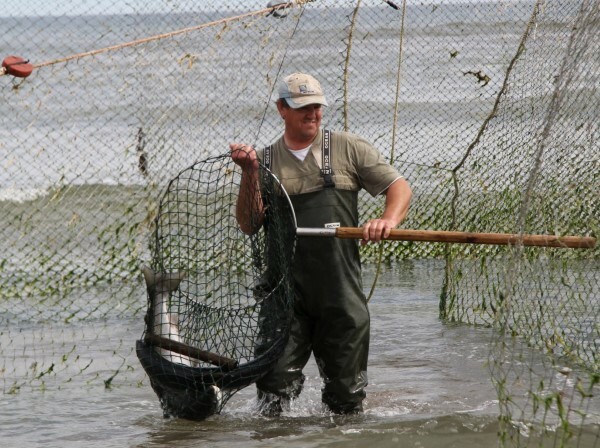 The 2013 summer drought caused very low flows in most rivers and thus salmon were simply unable to access their rivers of origin, forcing them to run the gauntlet of coastal nets for weeks on end. There are no quotas set for wild salmon and consequently there is no mechanism to limit catches – whatever the strength or weakness of local populations. The 2013 net catch of 24,311 salmon compares with 16,230 in 2012 and 19,818 in 2011. In contrast the rod catch dropped to 66,387 in 2013 (the lowest figure since 2003) from 86,013 in 2012. 80% of the 2013 rod catch were released by anglers back into the water. Andrew Graham-Stewart, Director of the Salmon and Trout Association (Scotland) (S&TA(S)), commented: “The figures for 2013 exposes the absurdity of recent statements by Scottish Ministers that salmon netting in Scotland is declining. In the last three years dormant netting stations have re-opened and netting effort has increased substantially. The quantum leap in the netting catch in 2013 shows once again that salmon conservation is simply absent from Scottish Government’s agenda. On the contrary it is permitting much greater levels of indiscriminate killing by nets of an iconic species that is already under considerable pressure”. The North Atlantic Salmon Conservation Organization (NASCO) is adamant that, on the basis of the advice it receives from the International Council for the Exploration of the Seas (ICES), management actions with regard to net fisheries, “should aim to protect the weakest of the contributing stocks”. Paul Knight, S&TA CEO and Co-Chair of the NASCO NGOs, commented: “Coastal netting stations are completely indiscriminate in the fish they kill. They have no way of discriminating between weaker or stronger stocks. It is absolutely clear that Scotland, by failing to protect weaker stocks, falls far short of its international obligations under the NASCO treaty. Scotland is a member of NASCO through the EU”.